Craft Silicon has today unveiled new features on Little, its taxi hailing solution powered by Safaricom and signed a new partnership with KenolKobil that will see its drivers enjoy discounts on fuel. Little now allows users to pay for someone else’s ride through the Sambaza ride option, in addition to purchasing airtime at discounted rates. 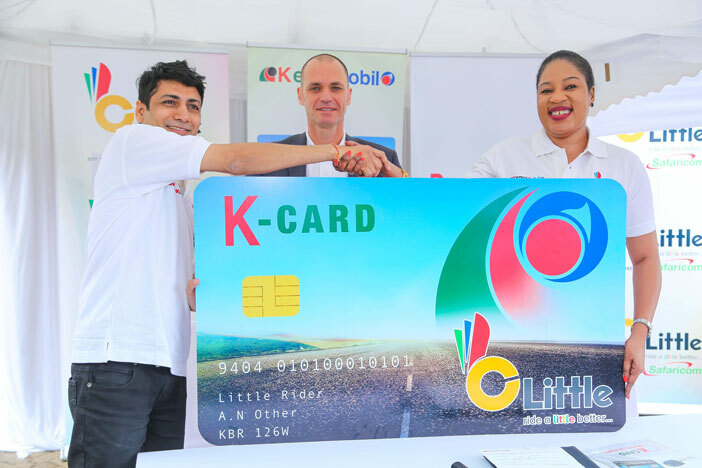 Drivers will also receive a K-Card, KenolKobil’s fuel card, with which they will pay for fuel and fuel products at discounted rates. “Improving our customers’ experience, and empowering our drivers economically remains twin key objective for us. Today, we have demonstrated that we are not only listening to our customers’ feedback but also looking into opportunities to empower our drivers. Through this partnership, we hope to significantly lower the drivers’ costs of operation, considering that fuel is a huge component,” Mr Budhabhatti added. Craft Silicon CEO, Kamal Budhabhatti (L), KenolKobil Group Managing Director, David Ohana and Safaricom Director Enterprise Business Unit, Rita Okuthe during the unveiling of the new partnership between Little, a taxi hailing service powered by Safaricom, and KenoKobil that will see Little drivers enjoy discounts on fuel. The new partnership seeks to significantly lower the drivers’ operational costs. “We are constantly looking for opportunities that not only benefit our customers, but are also beneficial to the ecosystem. In the case of Little, we are pleased that it is empowering drivers, who work hard each day to deliver satisfactory services to our riders”. Added Ms. Okuthe. Launched in July, the Little app has so far been downloaded more than 50,000 times on IOS, Windows and Android stores with over 3000 registered drivers, over 1600 of whom are active. The service can also be accessed by non-smartphone users by simply dialing *826#. Users can also share their expected time of arrival with their loved ones using any digital communication channel using the Safari Share feature. The app also features a corporate option though which businesses can offer service as a convenient corporate taxi option for their employees. A corporate dashboard enables businesses track and manage employee rides down to department level, while users can easily switch between personal and corporate rides on the app.